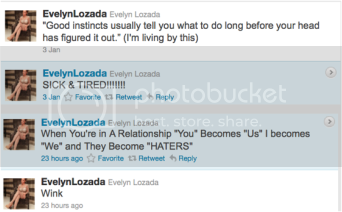 Did Evelyn Lozada Subliminally Confirm Ochocinco's Cheating? TMZ reported Wednesday that Evelyn Lozada put her wedding plans to NFL player Chad Ochocinco on hold because he couldn't be faithful. A source told TMZ that Evelyn "recently confronted Ocho after she became suspicious about his behavior ... and she isn't convinced he's been faithful." Since then, the Basketball Wives star tweeted a few subliminal messages for her followers which has created speculation that the rumors may be true. No representative from either party has commented on the rumor yet. We'll probably just have to wait until Basketball Wives returns in February to find out. Surely, that drama will unfold on camera.